This Website Is No Longer Active. : Carwyn Jones Hides. OK. So now we have it. As stated in the article HERE we were led to believe by Ruth Brankin who works in Carwyn Jones Office to expect a reply from the First Minister. So you can imagine the amusement or bemusement when we received the above letter from Janet Martin who apparently has been asked to reply on Carwyn Jones behalf. It appears that Janet Martin has the unfortunate task of being the delegated mouthpiece responsible for covering up. This is a matter in which the Welsh Government was involved over many years. We have been satisfied that the local authority and other agencies involved have followed the correct procedures and handled the case properly. The young person’s best interests have always remained the primary consideration. Even Welsh Assembly Government Minister Edwina Hart ( pictured above ) boldly and confidently states the same in her letter in an earlier article HERE . Which seems to leave our Janet with a hell of a lot of egg on her face as in the final part of her letter she states. "The Welsh Government is not prepared to comment on the case further.This will be the position of the Welsh Government unless any new issues emerge." Well Janet new issues have emerged. New evidence freely given in writing to Linda thanks to the fantastic efforts of David Rees AM have brought new evidence to light. See HERE. David Rees has confirmed what we all knew that " No Investigation Was Ever Carried Out By The Welsh Assembly Government Into This Case. " Evidence that Carwyn Jones has been sent and is fully aware of. David Rees has also made it abundantly clear that Neath Port Talbot Councils Head Of Legal Services David Michael at Neath Port Talbot County Borough Council confirms that they DO NOT have ( or ever have had ) any valid paper work that would have allowed them to remove Linda's daughter from her care from her sick children's hospital bed in America in 1998 either legally or lawfully. As previously stated "This is a clear case of Child Kidnapping and Child Trafficking on a False Passport." Lets not forget other new evidence that was previously denied to Linda that has only come to light in the last year or so as well as suitcases of historical evidence that we all hold on disc. This is why we required that Carwyn Jones as leader of the Welsh Assembly Government conduct a full and thorough investigation into this crime without delay. This is a matter that we require Carwyn Jones full compliance in and no excuses. Therefore Linda and other members of her team will be in touch with Carwyn Jones Office and will once again be enlisting the help of David Rees AM to obtain an appointment with the First Minister as soon as possible. Time for Carwyn Jones to " Man Up " I think. A very good point has been made to just now by a member of a group who have been watching Carwyn Jones over the Bridgend Suicides and the whole agenda of child abuse and paedophilia within the establishment in Wales. The Welsh Assembly contains at the moment one good man and one good man only. That man is David Rees the Assembly Member for Aberavon. David Rees unlike the rest of them and the finger now points firmly at Carwyn Jones has done his job and confirmed the truth. This is a crime .David Rees has proven it. Carwyn Jones is now without doubt covering up for the criminal acts that have been committed by Neath Port Talbot Social Services and prominent members of the Welsh Assembly Government. Carwyn Jones can now only be viewed as nothing more than a common criminal not fit for public office . Carwyn Jones you are a first class coward. They know they are in deep trouble when Carwyn jones needs to ask a minion to reply so as not to be seen to get his hands dirty. This is an embarrassment for Wales. So someone called Dereck Jones and this silly woman have been asked to front up Carwyns cover up. The true metal of the man is beginning to show. Man Up more like Own Up. Com on Carwyn we re not fools. A massive crime has been committed here. So sort it out. It is time for this to end and that family to be together.It is hard to believe it has been so long and no results please let the girl go home! Whether he likes it r not Carwyn Jones is duty bound to reply. A serious crime has been committed here and agents of his government and one of his councils are involved. The halfwit who said that the Welsh Government will not be commenting anymore needs to be locked up under some sort of insanity act. The Welsh Government in itself is either a corrupt corporation or a building of bricks and mortar. Just like a lamppost it cannot talk but it is the people who make up this CABAL OF CORRUPTION who must answer what has been done here. They are responsible to the people and the electorate so Carwyn Jones stop hiding and face the music. Quite unbelievable but not unsurprising. We are now seeing the last days of Carwyn Jones term as First Minister. The Welsh Assembly Government will now fall. The public know what has happened regarding Linda. Politician now have to follow suite. No more cover up please. ALL the evidence is in Linda's favour. The Bridgend Suicides and now the Linda Lewis case on Carwyns CV ! We don't need the press as what has happened here is already Global. One lovely mother deliberately denied justice by a member of a political party riddled with paedophiles. LABOUR 25 if you don't believe me. Carwyn Jones isn't payed to hide he his there to represent the people. I would not take no! for an answer. I would be demanding appointment.If he can't do the job then he should be sacked. I think not by the response Linda got. And i thought at last Linda was going to get help from first Minister Carwyn Jones. Just goes to show what he thinks of our Children. Surely Mr Carwyn Jones has a duty to reply and investigate Linda's case. It's about time those in power got off their back sides and helped in exposing the Criminals involved. Otherwise what is the point in having a Welsh Assembey Government. Carwyn Jones must have his head in the clouds.He should have acted immediately considering the crimes that have been commited by Social Services and other's. They are done for folks. Its over for the criminals in Cardiff Bay. The mentality and cruelty of the Welsh Assembly Government can be summed up by the date of the letter that Linda received. In my opinion and that of others there is no coincidence that it is dated the 18th of February 2014. Exactly 16 years to the day that Linda's daughter was kidnapped from America. These people need to be exposed , removed from office and jailed and put out of OUR misery. With your support we will do this. How sick are they ? I hope the case raises the profile for people who have had their Children removed from their care Wrongfully by Social Services. I'm extremely disappointed in Carwyn Jones. So,a Child being kidnapped is not important to our Welsh Assembly Government. I mentioned Harriet Harman and Liberty in my book. It shows how the rot at the top supports perverts and does nothing about abuse to children and vulnerable adults. Don't trust prominent politicians or civil rights groups as they mostly support the evil. There seems to be a high correlation between those who don't want to know about genuine victims being abused/betrayed and ones supporting abusers. This is definitive proof that it does happen. Harriet Harman and Liberty fit this 100%. I am glad I never got support from them after what they have turned out to be. Live with Jimmy Savile when I was in Leeds General Infirmary - I heard he was about but never saw him - glad I didn't now. You are fighting a really hard battle. One that you can win because you have truth and honesty on your side. Carwyn Jones should be removed from office. So sad it makes me feel sick,Linda has fought for 16 years for justice for her daughter. An assembly member confirms a crime has been committed and his boss covers it up. Seems that our excuse for a First Minister Carwyn Jones has decided that Wales is no longer safe for him too hide. Rag newspaper South Wales Evening Post says he's in America promoting trade in Wales. Child trafficking ? Child Paedophilia ? Child Suicides ? Child kidnaping. Stay there and go to Chicago and get a job with the mafia you embarrassment to Wales. First Minister Carwyn Jones can't just walk away,he has to acknowledge there has been Crimes Comitted. It is his responsible to investigate. It's about time all minister were regulated. The amount of evidence being ignored "shocking".Those who abuse their power should be made accountable. Sian James MP for Swansea East and Supporter of Child Abuse who verbally abused you and Brian Gerrish at a meeting is standing down at the next election. Are all the child abusers leaving a sinking ship at the same time. I don't think that Carwyn Jones will ever be looked at in the same light after this. Have you made a complaint to the Monitoring Officer. 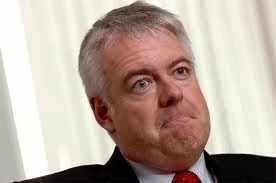 I beleive First Minister Carwyn Jones is guilty of Miconduct in Public Office. There is a Horiffic problem here that has to be addressed it is "unacceptablet" that a crime is being hushed up. Carwyn should do the decent thing and investigate the problem. I would report Carwyn Jones to the government in London. Maybe Cameron will shut down the Welsh assembly if they are not seen to be acting in the public's best interest. Perhaps Janet Martin should be First Minister at least she replied. DAILY MIRROR carried an article confirming the arrest of former North Wales Police superintendent Gordon Anglesea. It is imperative that the truth in this matter is publicly placed into the Public Domain by Carwyn Jones and the Government of Wales. On whose authority is he acting by ignoring the evidence so honestly obtained by David Rees AM and Linda over many years. Carwyn Jones is not fit for public office. Briliant Headline Carwyn can't hide forever. The System don't care about us they only care about themselves and their cronies,the only time you see any of them is when they want our vote. Protecting Children should be Carwyn Jones Number-One Priority. I applaud you as one of a few voices to campaign and also speak ouy on behalf of an innocent Mum and daughter. You will win out there is to much stacked against those criminals. CARWYN JONES is No! defence. frightened of tackling the situation. "Sunlight is the best bleach"
Carwyn you need sunblock . Loads of it. We know what you are doing.
" Hey Carwyn Leave Our Kids Alone "
I agree Carwyn should have given a reply. Why? aren't those involved in the Kidnaping questioned by the police. For years Linda has proved that a crime has been committed. An assembly member David Rees confirms this and makes it public. Carwyn Jones should be delighted at this and should be congratulating David Rees and looking to put things right. Instead he is covering it up using some useful idiots in Cardiff Bay to do his dirty work. Therefore Logic suggests Carwyn Jones is implicated in the many crimes against Linda Lewis and her daughter up to his neck. This is the end of Carwyn Jones. Please keep going its only a matter of time . Carwyn Jones and his cronies must be insane beyond redemption. Just how long to they honestly believe that this disgusting crime can be covered up for ? It's far too big to hide FFS. This is make or break time for David Rees. He is aware that a crime has been committed that he cannot get out of nor should he. Threats and ridiculous statements from those in the Welsh Assembly do not have any bearing on the case of Linda Lewis whatsoever. In a nutshell David Rees now needs to ignore the guilty in Cardiff and Neath Port Talbot who might try and stifle him. He is 100% + aware of a crime . It is his duty to continue to pursue justice at all costs. He has no alternative and judging by his moral fibre so far I am sure that he will. Will this case break the culture of back-room deals, cover ups and stitch ups endemic within the Labour Party in Wales ? Time will tell but I think so. Carwyn should man-up and face his resposibility and start asking questions. Shameful I hope all goes well for Linda she deserves it.Let's face it,to care you have to be Human. AT NO TIME DID LINDA LEWIS EVER STATE THAT SHE WAS GOING TO KILL HERSELF AND HER DAUGHTER. as you know Carwyn. What good has Carwyn Jones done for the people of Wales.Roll on the election. Government should make protection of Children their number one prioity. What is it going to take for people of this Country to be rid of smug government ministers. A vicious wicked cover up that comes from the head of the snake. Do we really need a Welsh government. This whole story only confirms the calibre of second rate scumballs that operate supposedly on our behalf. Carwyn Jones by his actions is dead in the water. This case needs to be fully exposed that is why they are acting like the underhand lowlife criminal pondlife that they are. Good luck to you stay focused victory I around the next corner. It is amazing that Carwyn cannot see how guilty the whole establishment is by his actions. But then again they are. This Labour political criminal is part of a corrupt self serving regime.For those that have eyes to see,the Labour Party and criminality are now one and the same thing. Both are corrupt, both are led by self-serving donkeys and neither serve the interests of the common people they were appointed to protect. Neither do they protect the interests of the working man and their families. They would rather abuse children in the most sickening way as that is their agenda. Jack Drobney and Harriet Harman ( Husband and Wife ) paedophiles who want to legalise sexual gratification from children. This sickness is throughout politics and politicians and has to stop. The abuse and torture of Linda's daughter is now universally known. It is obvious that the ruling Labour Elite in Wales have an agenda in which the abuse of children is strongly at the fore front. I do exclude the good man David Rees from this as he has a lot of work to do for all of us who support Linda in amongst the serial sickos that in habit Cardiff Bay. There seem's to be a total break down of Law and Order in this Country. This IS an injustice that WILL be rectified. Carwyn Jones be assured of this . Public awareness and Public opinion is growing every day over this case. Agree it will be a very positive move with 20,000 a5 leaflets about Carwyn Jones role in this crime and cover up and exclusively targeting Bridgend. Many hands will make light work. On what authority do they have to say that they will not be commenting any further ? Farcical cop out and a joke. Of course they must comment they are accountable to us the people. Keep posing the role played by the Welsh Assembly. Crooked Carwyn has no authority or mandate to prevent a proper investigation into Linda's case. It is the actions of a very frightened man terrified of being exposed along with the Ministers still in government with him . They have a lot to hide but no where to hide their shame. The Welsh Assembly government want more powers,what a joke the people of Wales would be better off without the Assembly. They do nothing to help the people of Wales. There need's to be a campaign to get rid of the assembly.The money saved would be better spent on our School's and NHS. These are the main bastards responsible for all the suffering that we as a people are forced to endure. DO NOT TRUST POLITICIANS OR BANKERS. Pass this on everyone needs to know their real agenda. Carwyn Jones has showed no respect to Linda and her family he knows their daughter was kidnapped. yet? he refuses to help why? when the evidence is overwhelming. I would report him to his peers. Davis Rees needs full support and congratulations. Carwyn Jones is guilty of misconduct in pubic office. Carwyn Jones avoid the Bridgend Suicide Issue ! Carwyn Jones avoids the Linda Lewis issue ! Is he behind the agenda of them both ? Is he afraid of us finding out ? Is he very afraid of exposure ? Carwyn Jones is a co conspirator with Julie Rzezniczek in the inhumane, cruel and disgusting abuse of an innocent Mother and Child. No empathy but riddled with the constant terror of what he is and what he is covering up. In a sad way I pity his pathetic and immoral response. Schoolboy Bully who's victims are growing up and seeing him as the cowardly custard that he really is. This is a desperate man linked so closely to Gerald Elias he has no way out. What have they got on you Carwyn ? Anyone who has even vaguely become acquainted with ritual child abuse by the establishment as well as paedophilia knows very well that they will go to the ends of the earth to keep their activities absolutely secret. They are professional experts in covering their tracks. squeaky Bum time in the Lodge no doubt Carwyn ? No investigation by the Welsh Government = No crime committed. Sorry Carwyn we see through your deliberate attempt to escape justice and be brought to account. Shame on you Carwyn,you have no where to hide be a man and do the right thing. I'm sure Linda will get Justice with,or without Carwyn Jones help. This cover up will become known as Wales Shame. It will come out and will be shown for what it is. The paedos and perverts in all government are desperate. What has happened here is a disgrace but similar things are happening every day in the UK. These people need to be brought to justice without delay. The correct and proper actions of David Rees has confirmed the crimes committed by many in authority. He now has no choice but to see everything through to its lawful conclusion. Otherwise he becomes complicit in all the previous criminal activity. Surely no amount of bullying from Carwyn and his gang of reprobates in Government can override this factual state of affairs. This would be another criminal act totally outside of the law. Keep the pressure on as it is obvious what is going on here. A blind man can see. It is only a matter of time before Linda gets her victory. Its amazing how many people are waking up to the evils committed by those in power. Our politician ain't worth spit and deserve jail. I bet there's been an inordinate amount of public money being expended on covering up this shameful situation. Carwyn Jones this is not over it is just the beginning. There is no doubt in most peoples minds that this case will be fully out and freely discussed very soon. It pains me too see those that I once had respect for in our government disgraced and cowering away from the wrongs that they have helped commit against an innocent mother. People without honour will sooner or later lose their freedom and independence. The peoples time is coming. Carwyn Jones instead of hideing you must take this seriously. I am sure that if they are asked the Welsh Assembly Government would have supply a copy of the letter ( that never existed ) saying that Linda was going to kill herself and her daughter on which the fraudulent injunction was based ! Perhaps David Johnston( the only person who apparently saw the non existent letter ) would happily supply me a copy as well. Carwyn I am sure that you will supply me a copy of this letter ( that never existed ) if I email you. Then all of us can see this letter ( that never existed ) and be happy in the knowledge that the injunction in place has been properly obtained. Carwyn Jones is in power to deliver a service to the people of Wales.If he cannot deliver then he should resign. BSE (Bovine Spongiform Encephalopathy, or Mad Cow Disease) affect humans as there is a human version of mad cow disease called variant Creutzfeldt-Jakob disease (CJD). CJD affects the brain and is often fatal. There is also a political variant of Mad Cows Disease called Carwyn Jones Disease (also CJD) or Political CJD. It generally affects the integrity of ministers or politicians and brainwashes their way of thinking so that they become self-centred and motivated by greed, power and control supporting the corrupt and doing everything to whitewash their fellow wrongdoers as well as not representing the needs and rights of the victims of these wrongdoers. Political CJD isn't as fatal but the consequences of their perverted attitudes affects the most vulnerable within society. More needs to be done to eliminate Political CJD or restricting it from entering the civilian population. It is bad enough with Carwyn Jones having it. Over To You Carwyn Jones.